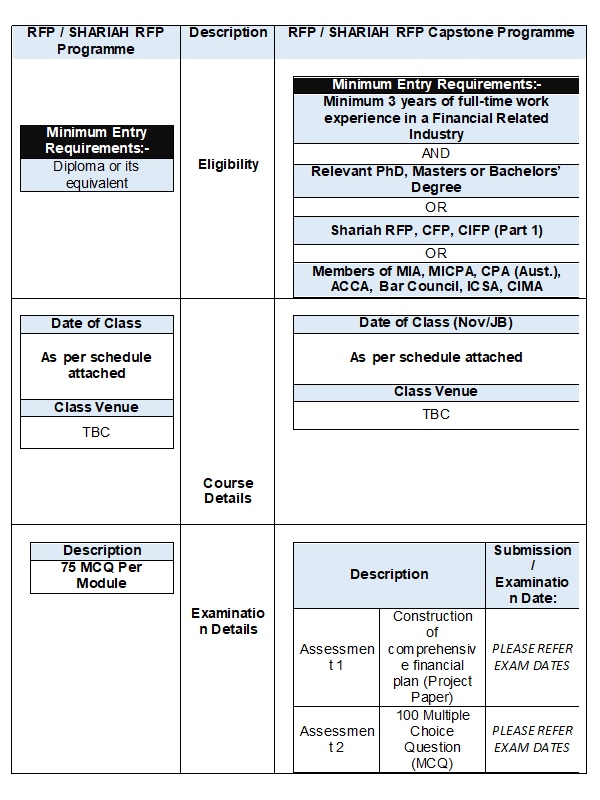 In line with the Malaysian New Economic Model to increase the pool of well-trained and educated human capital in Malaysia as well as to address the critical need for qualified Shariah financial planners in order to position Malaysia as the regional hub for Islamic finance, MFPC has designed a six days intensive programme, the Shariah RFP Capstone programme. 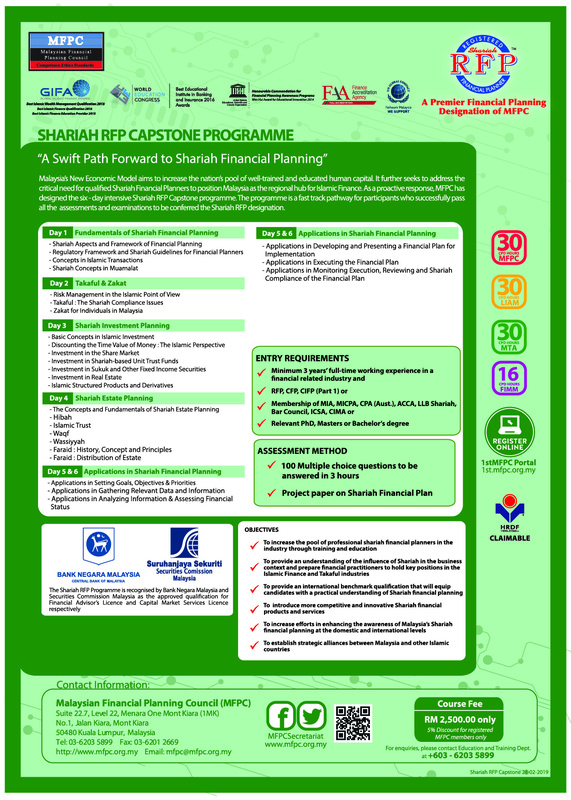 Shariah RFP Capstone programme is a fast track pathway for existing practitioners, accountants, lawyers or academicians to become a qualified Shariah financial planner. Participants of Shariah RFP Capstone programme who had successfully passed all the assessment and examination shall be conferred with Shariah RFP designation. To increase the pool of experts in the Islamic Capital Market through training and education. To provide an understanding of the influence of Shariah in the business contact and prepare financial practitioners to hold key positions in the Islamic Finance and Takaful industries. To provide an international benchmark qualification that will equip candidates with a practical understanding of Shariah financial planning. To introduce more competitive and innovative Shariah financial products and services. To increase efforts in enhancing the awareness of Malaysia’s Shariah financial planning at the domestic and international levels. Leadership Quality – Being and MFPC member, you will be accorded a place among a group of pioneer Shariah RFPs who are instrumental in the development of financial planning in Malaysia. Financial 1st Magazine – Financial 1st Magazine published by the MFPC is exclusively free-of-charge to the Ordinary Members. A special membership discount of 10% is given to members who wish to advertise in the Financial 1st Magazine. There will be three (3) intakes session in March, August and November.